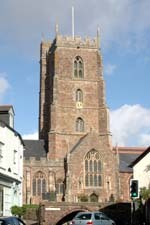 Very little is known of Christianity in Dunster before about 1100 AD. However about 500 years earlier, the people of the area would have been listening to the preaching of missionaries such as St Carantoc, Patron of neighbouring Carhampton, and St Decuman, Patron of Watchet. 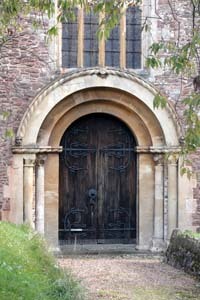 They had crossed from Wales and found places to live near the coast, and the steps and stump of a cross in the churchyard at Dunster mark the place where they, and other preachers, set up wooden crosses and spoke about Christ before even the simplest church was built in the parish. A church was first erected on the present site by William de Mohun during the 11th century, of which only the West door and North wall survive. Sometime during the last decade of that century, William de Mohun gave the small Church of St George, together with the tithes of several manors and two fisheries, to the Benedictine Abbey at Bath. The Priory is first mentioned in 1177, and the monks from Bath Abbey would have been responsible for the building of the larger church. During the reign of Henry 3rd. the Choir of the church was further enlarged, and from 1262 the Priory had a more distinct organisation. Its endowments were increased by the De Mohun family and the monks held and farmed a separate manor together with land to the north of the church. The majority of the present building dates from the 13th century, with the tower being added in the 1440's. The church at that time was shared for worship by the monks and the parishioners but, in 1357, the difficulties of sharing were beginning to emerge and in that year the Prior, Richard of Childester, drew up an agreement setting out how the church was to be used by each group. This worked for over 100 years but in 1498 trouble blew up again between priory and parish and, after arbitration in Glastonbury, agreement was reached. This resulted in the wonderful carved rood screen being constructed which crosses the whole breadth of the church, making it the longest in England. This effectively divided the church in two with the parish using the west chancel and the monks the east. This dual use did not last long for, in 1539 under Henry VIII, Dunster Priory was dissolved along with the monasteries.The priory buildings and land passed into the hands of the Crown and were then leased to John Luttrell, who lived in the Priory Farm beside the church. He was the uncle of John Luttrell who had recently inherited the castle. In 1543 the property was sold to the Luttrell family but shortly after, the rectory, the tithe receipts and the responsibility for appointing a vicar were conveyed to Hugh Stewkely, who in 1556 was accused of not making proper provision for a curate although he was receiving the tithe income. There then followed, over the next three centuries, a period of increasing neglect in the fabric of the church, and the Methodists and Wesleyans used this period to get a foothold in the village. This seems to also reflect the gradual downturn in the town's fortunes to the point when, in 1838, the architect S.C.Buckler condemned the church as "ruinous, damp, draughty and dangerous". However, after George Luttrell had a new village school built in 1872, and a complete restoration of the church began in 1875, then the influence of the Methodists and Wesleyans declined, and their properties were finally closed and sold off. The rectory remained in the possession of descendants of Hugh Stewkely until about 1790 when the property reverted to the Luttrell family. The lack of provision for a priest continued as a problem in the parish, there being a minimal endowment to support a clergyman until 1872, when a new vicarage was built by Thomas Fownes Luttrell, and the cure properly endowed.